1. What can I possibly add? What can I possibly add... to my little fleet? The answer was obvious, a 600 size... 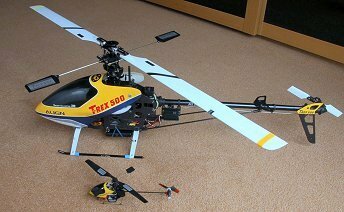 So I now have an Align Trex 600 nitro, built, set up and flown since this guide was originally published early in 2010. However, the title of this section is actually about this RC Helicopter Set-up guide. I wrote it to take my mind off buying more stuff! That didn't work for long. RC heli set-up; that's all it is. No construction tips, no flying lessons. So what can I add? You can now find virtually anything you will ever need to know about RC helicopters on the Internet. There is loads of stuff on set-up written by far more experienced people than me and the forums are full of discussions about it. In fact there is almost too much and it can be hard, sometimes, to find just what you need to know, particularly as a 'newbie'. Why add to the confusion? Firstly, I feel I owe a debt to the RC heli community and secondly I think there is something slightly different that I can offer. If I achieve nothing else, terminology, abbreviations or acronyms that may be unfamiliar are linked to a definitions page (click) when they first appear in a section. Please note, because of the 'purist' way the page layout in this guide is controlled (using a .css file and layered graphics), links in the main text may not work in old browsers (e.g. IE v6). Assuming you are using any current 'mainstream' browser, they will and you can return to the main text, or a previous definition, by clicking any Go Back link there. If you are new to this hobby, be warned. Someone on the forums once said 'getting into RC helis can mean plumbing a very deep well'. I think they were talking about the knowledge needed, but it also refers to the bottomless pit down which you can throw a lot of money! When my heli obsession began several years ago (at the ripe old age of 55) I had never flown anything other than a free flight aircraft and a control line 'plane (badly). So I started my RC career with what is arguably one of the most challenging types of model to control, adjust and maintain. I taught myself to crash, repair, setup and ultimately fly RC helis and went on to assemble and modify them. The electric powered ones have ranged in size from a tiny 'Buzz Fly' to a scary 'pigeon killer', the Align Trex 500. Recently I have gone over to the dark side and joined the nitro club. I even learned to fly a foamy (see 'plank'). If you don't believe me take a look at HollyHeliVid's channel on YouTube. How did I do this on my own? Well, of course, by spending countless hours on the PC, Googling, lurking on forums and by keeping the postman (mailman) very busy! The list in Section 12 bears witness to this. Although I learnt a huge amount, most of the first six months was spent trying to keep ill set-up and badly designed helis out of the dirt. Like an idiot, I had transferred straight from a (relatively stable) twin main rotor co-axial model to an Esky 'Honey Bee' CP2, which has a single main rotor with the added complication of variable main blade pitch. I encountered a steep learning curve. Although good value, the CP2 was not the most stable nor reliable of models and has a separate (overstressed) electric motor driving the tail rotor, rather than belt tail drive standard on almost all 'proper' helis. Most of this guide will assume a belt-driven tail rotor with variable pitch tail rotor blades, which is where quite a bit of set-up know-how is needed. Gradually, all the reading and the experimentation came together and I can now assemble a CP heli from a box of parts, set it up on the bench, then test fly it with no more than a minor trim required. If I could have found one website that brought together all the essential stuff and chosen the right heli at the start I could have been where I am now in half the time. ChopperAddict has done a fabulous job bringing together so much on a single website. Hopefully the 'Wall of Shame' will warn you off the unsuitable products. He has also produced some excellent technical articles and hints and tips. I'm not trying to 'steal his thunder', but I want to independently tell you everything you need to know about the basics of CP heli set-up in a concise and consistent format, in the least space possible. However, wherever more detail, or an alternative view, is available within the site, I will link to those other pages. Most importantly, I want you to understand what you are doing. Whilst this guide is aimed, in the first instance, at relative 'newbies' (I was there very recently and haven't yet forgotten how hard it was), hopefully there may a few hints, tricks or links of interest to experienced fliers. I deliberately restrict myself to teaching terminology and set-up principles and practice. For an excellent all-round guide to electric helis, check out The Electric Helicopter Beginner's Guide by Toshiyasu Morita and Mark Pearson. I now have experience of IC engine powered machines and aim to expand this guide to include their set-up over the next few weeks. However, other than the throttle function, most of the set-up of electric and IC helis is very similar, although safety considerations (covered in Section 3) are very type specific and perhaps less apparent for electric helis. Whilst it is possible to teach yourself all you need to know about RC helis from the internet, I now know that joining a good RC flying club (preferably one with experienced heli pilots) is a great additional help (and fun) and is essential if you wish to safely operate the larger machines. Check out the BMFA website for local clubs. Currently this guide only covers helis with flybars, but I also hope to expand it to cover flybarless set-up, when I have gained more experience of this newly developing area (I currently have one small flybarless machine). I have used both the simple non-programmable radios (Esky and Walkera types) and also the much more versatile, but more complex, Futaba, Spektrum, JR and BuzzFly (Walkera) microprocessor driven programmable ('computer') radios, 35MHz and 2.4GHz and I attempt to point out the differences between these when providing example set-ups. So, writing this guide from scratch and keeping it current is the challenge I set myself. By doing this on ChopperAddict's website (rather than distributed through innumerable forum threads), maybe I can pay back some of what I gained, plumbing the depths of that well, from all the people who have taken the time to set up websites, make instructional videos and give help on forums. If you have any comments, suggestions or corrections, you can contact me via ChopperAddict, or email me direct. My email address is at the bottom of each page (it's not a link and it's in text to prevent automatic harvesting - sorry). You need a rough idea of how helis fly and why they are designed and engineered the way they are. After that, there are some essential tools and pieces of measuring equipment that everyone needs. I offer tips on both very simple, cheap methods and also provide descriptions and (my own) photos of products that can make life easier. Early on, I talk about safety, please don't skip this bit. Subsequent sections of the guide will highlight safety considerations in red, where appropriate. You need to understand, in simple terms, the principles behind each set-up task. This may just be a bit of 'commonsense' that isn't obvious, or it might be a simple bit of engineering or aerodynamic know-how. I will try to provide the necessary understanding rather than just giving out instructions. There are two aspects to set-up. Mechanical adjustments and electrical/electronic set-up, which may include programing a computer radio. Advanced set-ups might also include separately programing motor ESCs, gyros and auto-stabilisation devices. Things like gyros often need different set-up according to make and model. I have tried to cover the reasons behind this and give some examples, but most products come with instructions and there are many guides out there already. There are some differences in methods of set-up for different designs and manufacturers. This guide largely ignores co-axial helis I'm afraid, but they are almost always FP and relatively easy to maintain and fly. I will try not to forget FP single main rotor machines, but most of the complexity comes from CP. <1 Why this guide? There's loads on the Internet about RC heli set-up, but it's not all in one place. <2 I'll try to explain all the jargon as it crops up (see). <3 You need to understand 'why' as well as 'how', I'll try and cover that. <4 You need some basic tools and you need to stay safe – look out for the red bits! <5 Different design helis and different manufacturers' stuff sometimes need different set-up. © John E Wilson 2011.